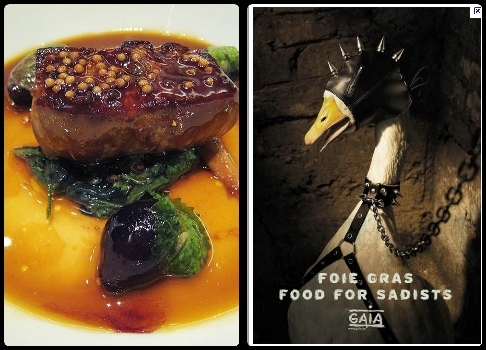 It's delicious, but... Where do you stand on Foie Gras? This week Bloomberg took an interesting look at both sides of California's Foe Gras ban, which is set to take effect next July. The law was passed in 2004 and signed by then-Governor Arnold Schwarzenegger. However, enforcement was put off for eight years to give producers time enough to find force-feeding alternatives. Those alternatives haven't appeared. Opponents of forced-feeding include major animal rights organizations like People for the Ethical Treatment of Animals (PETA), famous chefs (e.g., Wolfgang Puck, Charlie Trotter), and high-profile celebrities such as Paul McCartney, Alicia Silverstone, and many others. All cite the cruelty and inhumanity of forcing feed into the esophagus of a duck or goose through a funnel, a process that takes only 2-3 seconds but is thought to be painful. Studies have shown that mortality rates among force-fed birds can be elevated in the latter stages of fattening. Those in favor of forced-feeding -- chefs, foie gras purveyors, and gourmands of all stripes -- say that the forced-feeding process is not painful, and that it imitates the gorging behavior of birds in the wild as they prepare to migrate. Force-feeding is not new. Evidence exists that, as early as 2500 BC, ancient Egyptians force-fed geese. The process spread rapidly across the Mediterannean and into Europe and has been widely used ever since. The Bloomberg article by Allison Vekshin, Foie Gras Lovers in California Will Soon Become Victim to Rights of Ducks, interviews people on both sides of the issue. Among them are chefs who serve Foie Gras, some of whom intend to ignore the ban, and others who plan to reluctantly comply. Perhaps the most interesting factoid in the article is this: San Francisco chef Gary Danko, who has won a Michelin star for his namesake restaurant, usually sells 40 orders of Foie Gras each night, but when protesters show up the foie gras orders double. Where do I stand? I've enjoyed Foie Gras perhaps a dozen times in my life, mostly in France. It's always delicious, whether prepared and served simply or gussied up with a fancy sauce and other ingredients. No matter how it's prepared, it tends to melt in your mouth. However, I stopped eating it long before I realized there were ethical issues involved, because it's one of the foods highest in choleseterol -- a whopping 255mg per 100g. But even if I didn't have to keep an eye on my cholesterol level, I still wouldn't eat it now. I'm not sure that forced-feeding is painful, but it might be. That's enough reason to kill my appetite.